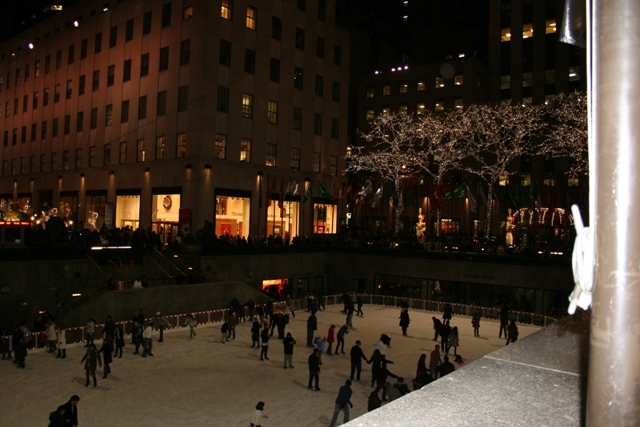 We loved the area around the Rockefeller Center – a real winter wonderland right in the heart of Manhattan. So much festive stuff to see and do, we ended up coming here several times during our New York week. The whole complex, built during the Grand Depression of the 1930’s really seemed to sparkle at Christmas time. 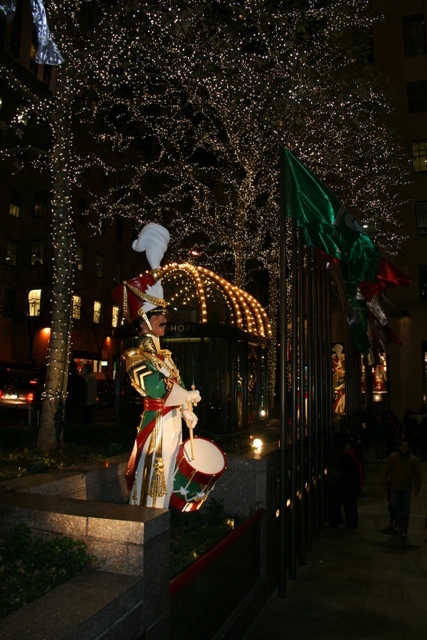 Walking from Fifth Avenue we found bugle playing angels and toy soldiers – interesting by day and beautiful lit up by night then braved the masses to get to the famed Christmas tree. Everybody in the city (or so it seemed to us) comes to see this tree, the crowds are never ending. We put up with the jostling and secured Son in his stroller to get close to the towering spruce tree. It takes centre stage here – rightly so – it is enormous and with 5 miles of lights it definitely sparkles. Stunningly simple with only lights and a star as decoration I loved it, the scale of the tree just takes your breath away. Lit every day in the run-up to Christmas it is a New York must see. The ice-skating rink right below the tree looked very glamorous and gorgeous, we decided to give this a miss preferring instead to watch as others glided over the ice. My abilities in this area are dodgy and decidedly ungraceful at the best of times, I didn’t fancy my chances of staying upright with a four year old thrown into the mix. Maybe next time…. 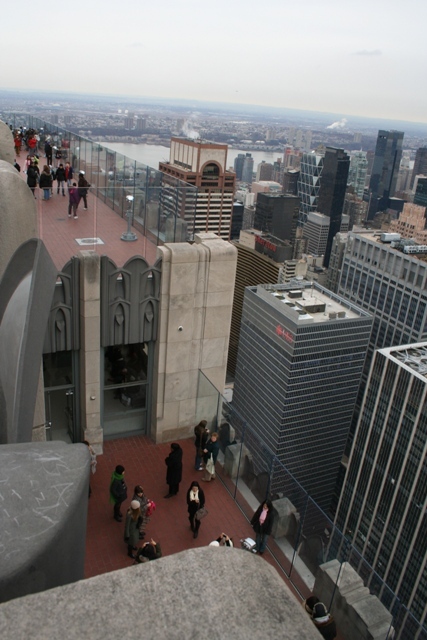 A trip to the Top of the Rock in daylight hours was another of our Rockefeller highlights. 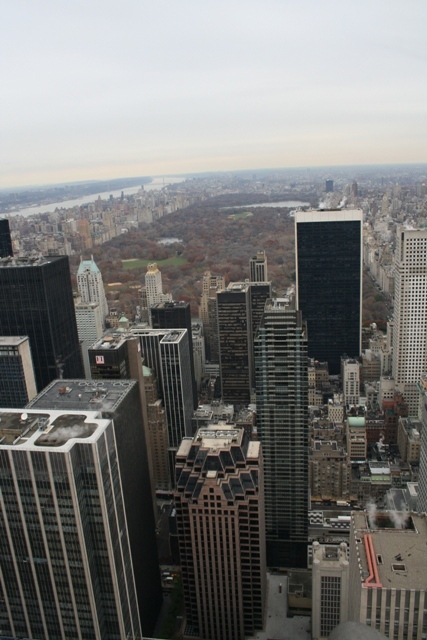 Almost seventy floors above mid-town Manhattan it is an amazing place to take in the scale of the city. 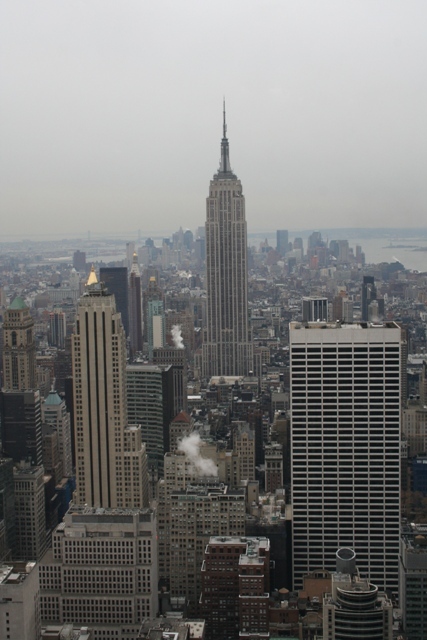 We bought our tickets on-line in advance – the timed admission was welcome, no queues and it was uncrowded at the top – very different to the long lines and packed spots at the top of the Empire State Building. Son would have been happy with the ride in the elevator alone – a glass roof and fluorescent lighting in the lift shaft made going up and coming down quite an experience. When we emerged from the elevator at the top I have to confess to knocking knees and a dose of vertigo. A few deep breaths though and I managed to get my act together. No such problems for Husband or Son, they were entirely in their element and loved the stunning views through the floor to ceiling crystal clear glass – seventy floors up and glass walls makes for an amazing 360 degree panorama of the city. 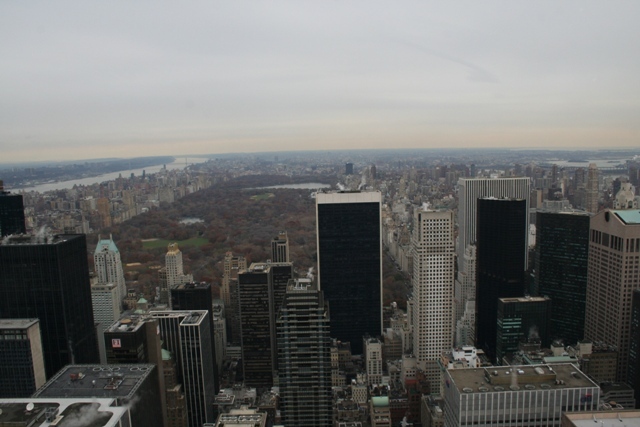 We had unobstructed views of Central Park to the north and the Empire State Building to the south – Son was super excited to spot the Statue of Liberty in the distance too. I just focused on the views and tried to forget about the height. There are three levels – one is enclosed and the other two are open-air terraces – magnificent views all round from many different angles – or so Husband told me, I stayed firmly inside. When the others had taken in the views from all sides and angles I was not too disappointed to be heading back to ground level again. Looking back now though I feel frustration that I couldn’t enjoy it more. Where else could you get such amazing views of such an iconic city. If or when we return to New York I am determined to go back up again and conquer those fears. We saved the best for last. As a final New York Christmas treat we visited the Art Deco gem that is Radio City Music Hall to see the Christmas Spectacular. Tickets were readily available when we booked on-line a couple of months before our trip, we got great seats with perfect views close to the stage. The building itself is gorgeous, we lingered a while in the splendid foyer – ogling the incredible chandelier. Get inside early too is my advice – the grand and cavernous red and gold auditorium is splendid and worthy of some admiration before the show starts. Son was enthralled by the Wurlitzer organ booming out holiday music before the show – everyone was happy. As for the Christmas Spectacular – it more than lived up to its name. Colourful, bright with so many incredible scene changes it was breath taking. The Rockettes charmed our socks off with their dazzling kicks and dancing, the sparkly costumes were gorgeous and the fabulous music – well I could go on forever. This was cheerful Christmas escapism at its best. Santa made a star appearance close to the end and we saw a memorable Nativity scene. The absolute perfect way to spend a last evening in New York. 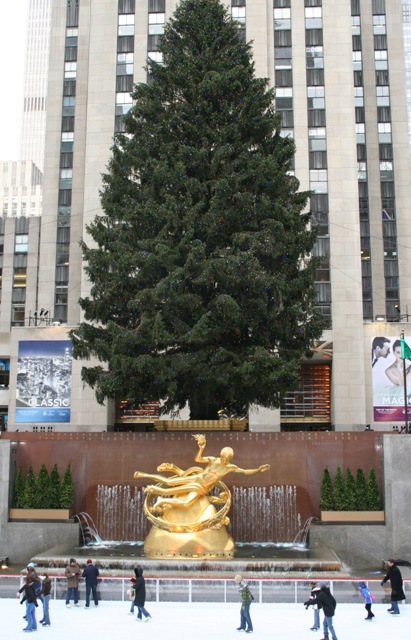 It’s been a couple of years since I’ve been in NYC at this time of the season–your post brought back wonderful memories! 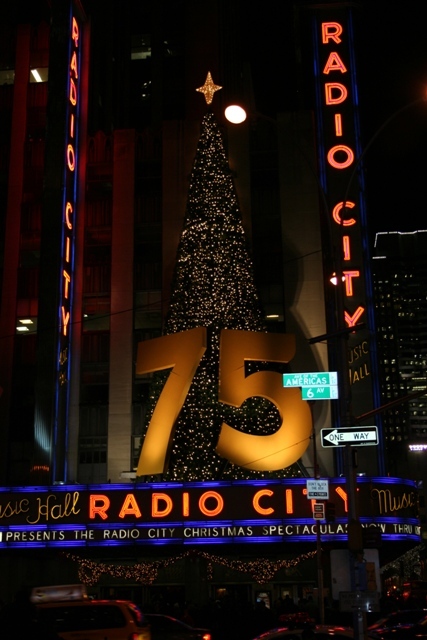 I agree about the Christmas Show at Radio City–I went in thinking I’d hate the kitsch but I loved everything about it! We loved it so much too – the whole show was superb and really got us into the right mood for Christmas. I love Manhatttan! Never been on the Chrysler Building. Looks awesome! I love it too Erika – just everything about it!! Merry Christmas. On this trip we stayed for a week – that was just perfect for me, there is so much to see and do you can easily fill your time. However on past trips we tended to stay 3 or 4 nights, also good but you have to rush a bit more. I need more holidays too so I know that feeling exactly!! Merry Christmas. It is such a fantastic place to be at Christmas time, we loved the whole buzz and atmosphere and would love to go back at this time of year. Hope your Christmas is a good one this year! That sounds amazing too – sometimes something you stumble upon like that can be a real highlight. Merry Christmas! I never tire of the Christmas extravaganza at RMH. 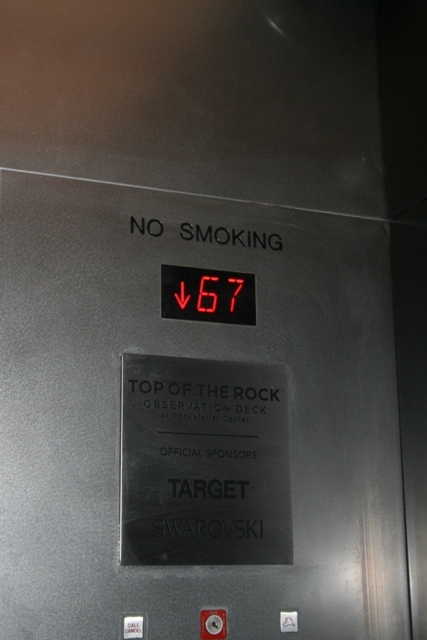 When I took the girls to the Empire State Building, the elevator line was so long we climbed to the top. I was puffing and panting when we got there which reminds me of your Florence cathedral climb. That sounds like a worse climb though than the Florence cathedral one!! Radio City Music Hall was definitely one of our highlights – I think I could see this every year and never tire of it either. It really does sound like a wonderful time to visit NYC. We must take a trip to see a show at Radio City some time. It is worth it if only to see the inside of the building – the chandelier in the foyer is gorgeous and the whole place is just beautiful! I have been into the building before and quite agree with the impressive stylings. So definitely the next mission is to see a show there. You’ve inspired me. I would love to see the Thanksgiving Day parade in New York, hadn’t thought about St Patrick’s Day but that needs to go on my list too!! 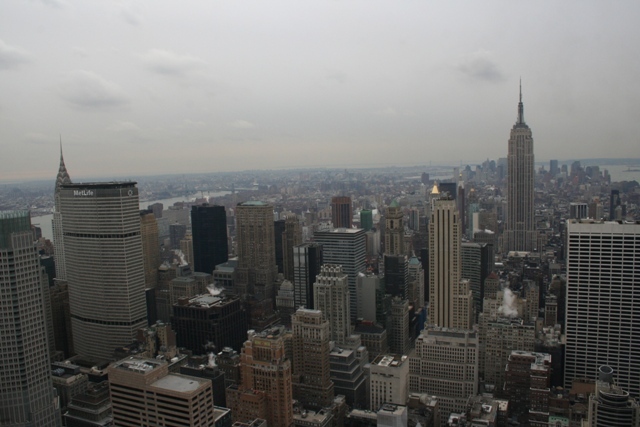 That’s the trouble with New York – so much to see! Hope you and your family have a lovely Christmas too Laura. 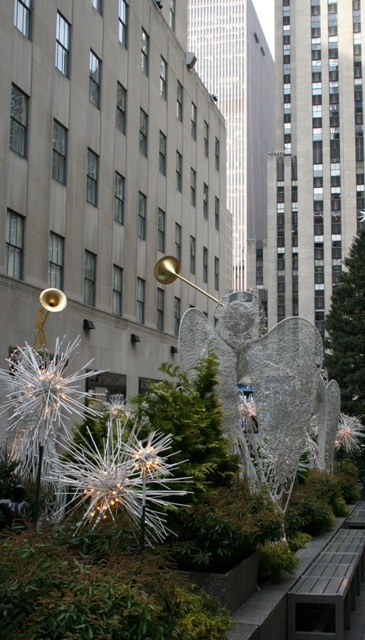 New York City is beautiful with all the Christmas decorations! There is so much to see and do! Thanks for your posts! It’s been several years since I’ve been myself. It was nice to have a reminder of what it looks like. We adored this trip – the city took on a real magical quality and was just what I had imagined – it definitely lived up to my expectations!! Merry Christmas Caryn. My brain is full of that sort of stuff (but nothing useful in there at all!!). Hope it comes in handy!! Have a merry Christmas Jenny. The views were amazing Rosemary – just a weird feeling came over me that I totally wasn’t expecting. Still… Hope your Christmas was merry too, likewise I love your blog posts – nice to get a taste of life down-under and all your travels as well! I wish you and your family all the best for 2015 too – hope it’s a good one. 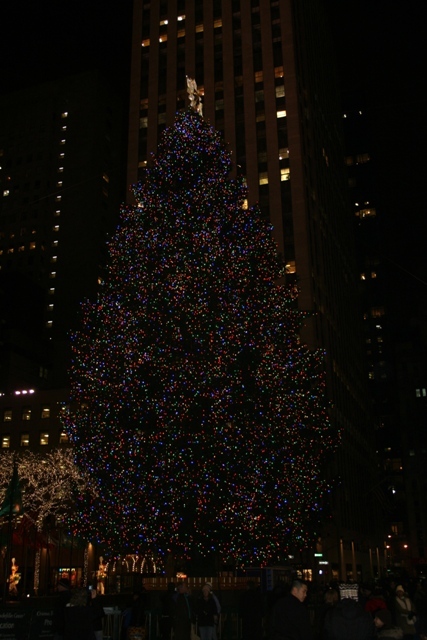 Christmas time in a big city is the best! So fun! Totally agree – we loved the atmosphere, the lights and just about everything! !